“Bookish” is the 17th annual exhibit by ASU-based A Buncha Book Artists (ABBA), a group that often crosses disciplines into writing and technology, widening the definition of artists’ books. A few of the artists explore the re-appropriation of old books into sculptural forms, as in “Elpesodel Tiempo” by Antonieta Carpenter Cosand. It consists of decades-old diaries — with handwriting somewhat visible — joined together and splayed out into three standing semi-circles. Other artists use artifacts of publishing and printing to create found-object assemblages. 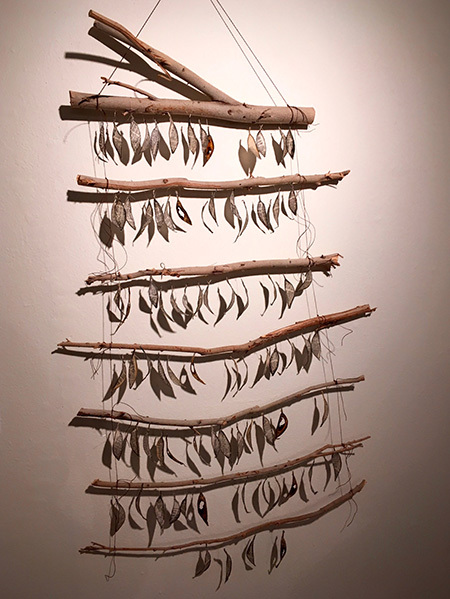 Another technique is appropriating the pages themselves, as in Cheyenne Black’s “Leaves: A Cento,” in which leaf-shaped pieces of text hang from branches; the text contains excerpts from well-known female writers. “Interrupted View” by Stephanie Burchett has topical resonance in referencing the U.S.-Mexico border fence and an American flag. The digital photographs are embossed onto a stand-up accordion shape, which is ready to be folded into a steel box. Also confronting contemporary issues is “I Heard You, Did You Hear You?” by Hailey Tang, in which a simple paper gatefold form deals with gender identity through words and images. Sam Fresquez deconstructs the idea of books by concentrating on alphabet letters, creating delicate boxes composed entirely of tiny, laser-cut wooden calligraphy. ABBA considers the components of books — typography, pages, images, binding, spines and covers — to be the surest means to expression.